Many a times I have lamented over the lack of a good nasi lemak stall in Ipoh; this probably stemmed from an omnipresent urge to indulge in the most sinful, aromatic, fluffy nasi lemak boiled with a heavy dose of coconut milk at every opportunity presented. Although my earliest memories of eating nasi lemak back when I was still a toddler (yes, me and my brother developed a penchant for all things spicy, fiery and tongue-numbing since our tender ages) was the nasi lemak bungkus version sold at the wet market; the Pasir Puteh wet market to be precise; gradually the evolution of modern nasi lemak sellers took the experience to hawker stalls within coffee shops, air-conditioned cafes and even gourmet (read: overpriced) version in 5-star hotels. However, save for a few passable options (Nasi Lemak Allongs in Ipoh Garden, that nasi lemak stall in front of Maybank Ipoh Garden), most of the others in Ipoh faltered – either the rice was lumpy, lacking in flavour from the infused coconut milk (santan), or the sambal was tasteless or too spicy, or the anchovies hardened and imparted an impression of biting into rocks or twigs. 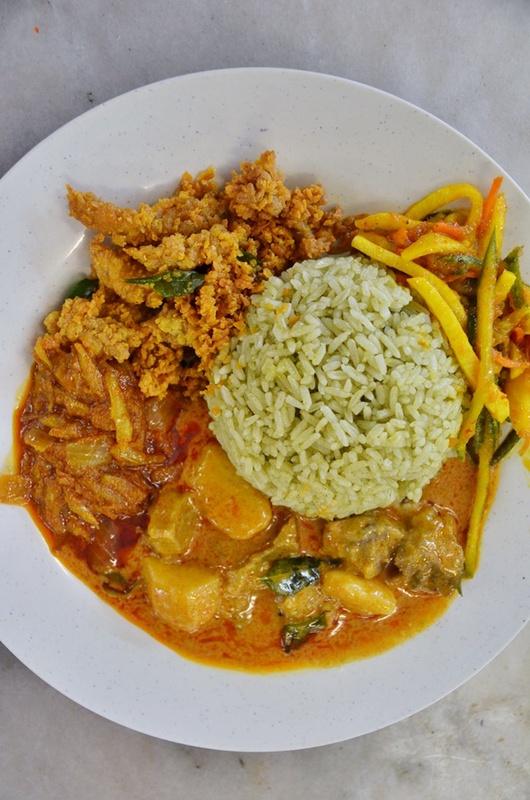 Sometimes, it could be hellacious combination of all the above, plus the trader substituting the rice with plain white rice with the excuse of serving a ‘healthier choice’ (this happened to me at least a couple of times in Ipoh, mostly in the more modern kopitiam setting. Hello? If I feel like eating steamed white rice I won’t patronize a nasi lemak stall, okay? Fast forward many years ahead and just when I was about to give up hope on finding a gem of a nasi lemak in Ipoh, I stumbled upon this Nasi Pandan stall in Gourmet Square/Medan Anika Selera/Tung Koo Thing in Ipoh Garden. Well, not exactly stumbled, for I have missed this despite the several visits and write-ups that I have done on this particular food court that has evidently stood the test of time – all the while standing strong despite Woolley Food City’s transformation, continuously changing the stalls line up and even committing a blasphemy of a decision to shut down for dinner hours and only open during the day time. Weird? You can say that again. 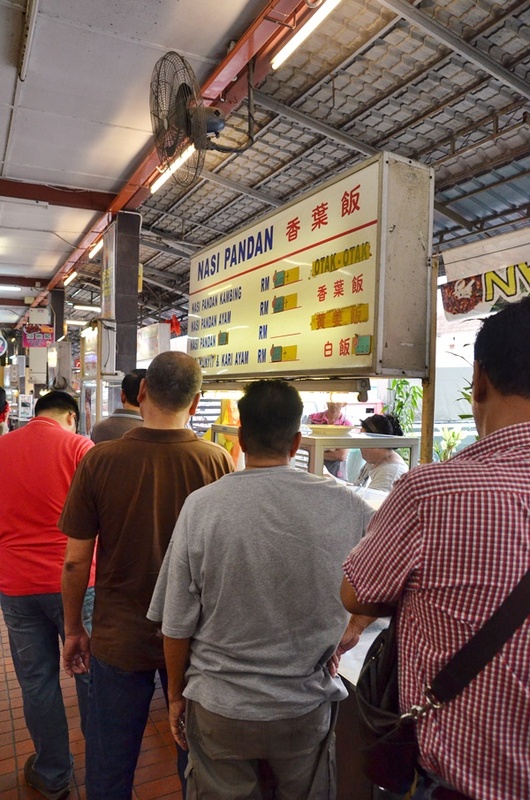 But Gourmet Square still has this inherent allure of a traditional hawker food centre, both drawing in the locals as well as the tourists, despite the sporadic calls for injustice no thanks to the price hike and shrinking portions from time to time. My dear, this is the era of our Government Saying Thanks for doing our part as loyal citizens to support the economy and cash flow. So let’s not shift the blame to some petty hawkers in a blanketed approach shall we? Although you may be right, some of the ‘tow kay’ of the bigger names could already be swimming in cash revenues for years prior to this without proper taxation. So this tips the guilt-scale somewhat. 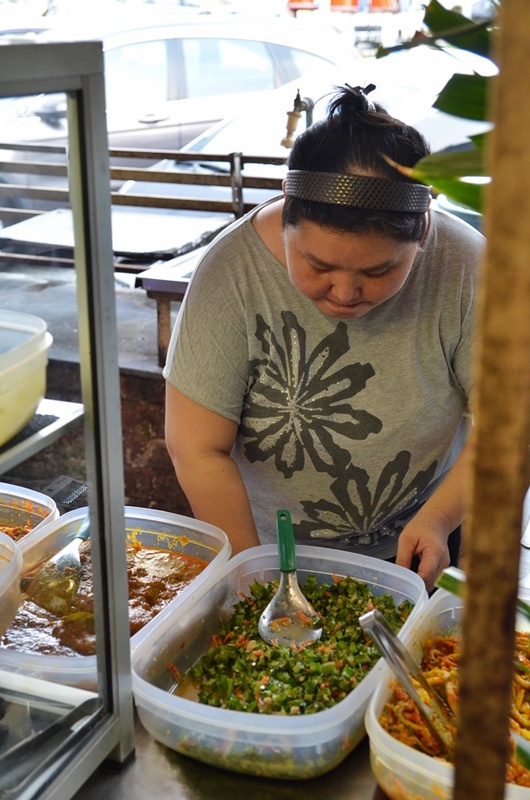 Anyway, back to the story of the day – the Nasi Pandan stall. Amongst the sea of hawker food stalls there, it is pretty hard to miss this one; with evidently the longest queue come dinner hours (try before 6pm to secure your portion without strangling the ones in front of you who is taking away half a dozen packs). The stall itself was almost non-descriptive and without fancy decorative ornaments. Heck, she did not even bother naming the stall. Simply named Nasi Pandan (nasi = rice, pandan = screwpine leaves), this stall is largely a one-woman show, she patiently scoops the dishes of one’s choice onto the plate first filled with a bowl-ful of jade green tinted rice; nicely arranging the side dishes within the perimeter of the plate, not even once losing her composure. There’s almost a fist in the air moment after you get served, but for her she will just move on to the next customer in line patiently; despite the snaking line of people waiting and staring helplessly at the mouth-watering dishes on display. 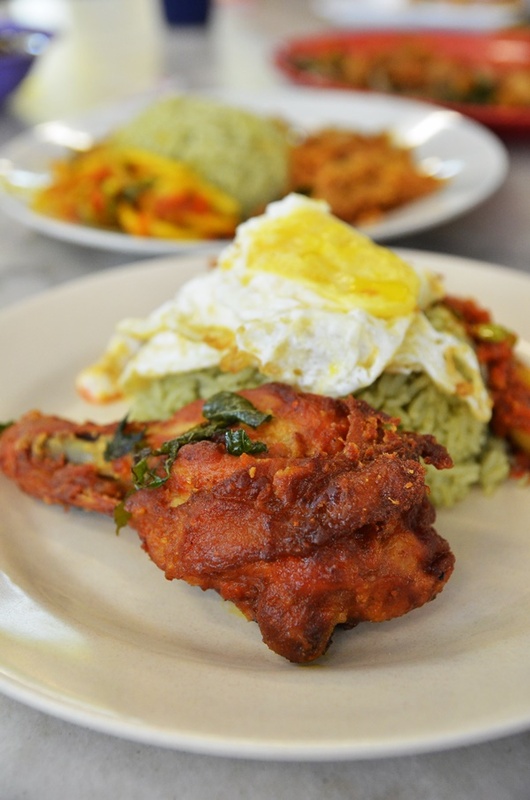 There’s her most iconic crispy fried chicken drumsticks; infused with spices and curry leaves that usually vanish within an hour or so after commencing business, and then there’s the impressive sambal petai with caramelized onions that lend a certain sweetness to the chili paste. The crumb-coated deep fried mantis prawns with curry leaves could have been more flavourful and spicy, but still could measure up to any ‘chu char’ places in Ipoh. The curry mutton with potatoes had really tender cubes of mutton; with the fats trimmed to a reasonably-acceptable level. But most importantly, the make-or-break factor is still the rice. In this case, the cleverly-stained with juices from the screwpine leaves (pandan) leaves an aesthetically pleasant impression on the diner, and the compounded aroma of pandan + santan stimulates the olfactory senses to a high as well. Cooked to a beautiful, fluffy consistency, the grains were separated rather than clumped together, and soaked up the curries well. A clear winner, and even more so when paired with the sambal bawang (onions) on the side. However, be warned that this won’t be another generic hawker stall with prices to reflect the ambience. 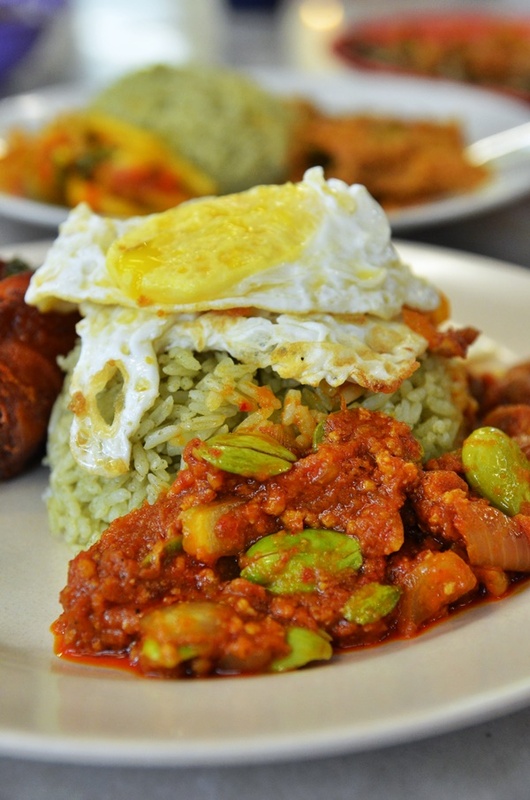 The two plates of nasi lemak pandan with two meats each (fried chicken + sambal petai, fried mantis prawns + curry mutton) and fried egg, vegetables and sambal bawang came to MYR24.80, a startling price tag that may surprise your kid should you ask them to buy their own food with a piece of MYR10 in hand. To me, fairly deprived of good nasi lemak (including the times spend in Singapore, and the closest to Nasi Lemak Pandan I have tried was at Tanjong Pagar Plaza but that was not memorable despite the popularity), I certainly did not mind paying a slightly higher price for the quality. The 15 minutes of queuing up was a bit of a deterrent factor, but compared to the half an hour or 45 minutes in line for some of hawker foods in Singapore …. This was nothing, really. Yeah! Another food joint to hang out! Haha… So true on the white rice thingy! Might as well go to “chap fan” stall ???? At MYR12.40 each is reasonable when you have 2 meats, prawn & petai[these 4 are main dishes], egg & veges[these 2 are minor dishes] in each plate. In S’pore, one main dish is $3 & minor dishes $1. If I have this same plate in S’pore, this will come to $14 excluding rice.The price would be higher in an aircond foodcourt.